Anyone else suffering a little case of the Monday blues?!? I am convinced the weekends are getting shorter and shorter, and it appears that my Monday blues are getting the better of me quite literally. Well, I’m here to help permanently change your thoughts on feeling blue. The color blue is said to reflect stability and intelligence, so instead of yearning for Friday, I’m going to put my best foot forward. It’s always a bit easier to do in Valentino. Bag, Anya Hindmarch: So many of you have asked about my bag, which I literally tote around everywhere (pun intended). This comes from one of my favorite British handbag designers, Anya Hindmarch. I will be showcasing some of my favorite Anya pieces in an upcoming post, and if you’re not already obsessed with her, I assure you that you will soon become obsessed. Apologies in advance! Topper, Classiques Entier: This is a more “mature” brand that I have come to love in recent shopping trips to Nordstrom. If you’re looking for elegant, good quality pieces to add to your work wear, this is the brand for you. I snagged this cobalt blue topper coat on sale, and I absolutely love it. So many designers at all price points are coming out with some great toppers that can be worn all year which is always a win. Shoes, Valentino: I’m always amazed at how many compliments I get from men as opposed to women when I sport my favorite rockstud heels. I personally go for the 2″ heels as you can wear them all day without feeling like you never want to wear shoes again. NOTE: some of the more fun colors are currently on sale!!!! I want to hear from you, so let’s get connected friends! I love this rockstud color! I want these Monday blues! Funny, I wear blue on Mondays. I haven’t really thought about taking it up a notch. If you have any blue suggestions for the guys, let me know. I advise my guy friends to go for a good pair of sturdy, well-made loafers. There are some great blue options from navy to cobalt that are fantastic, and you still maintain a professional look. I have a crush on your bag! I’ve been looking for a tote bag like yours for a while but I just can’t seem to find the perfect one 😦 great post! Ahh I love it! Even when I have those all black days, my bag tends to scream hello. 🙂 It’s tough to find really fun bags at decent price points, but I’m working on it! If the Monday blues look like this I will take a Monday everyday! Love Love Love! Wow the shoes are awesome!!!! So most of my friends have never heard of Anya, so I’m so happy to hear you are a fan too. I’m OBSESSED! Granted not so much with the price. She is just too much fun. PS. I’m super jealous of the weather you’re having now. If my office wasn’t so cold, I’d have to wear crop tops and shorts haha. Serious case of shoe envy!! Those Valentinos are the first thing I am purchasing if I win the lottery 🙂 Check out my blog for my post featuring nordstrom sale pumps! Love the heels and great color! Can’t go wrong with Valentino!!! 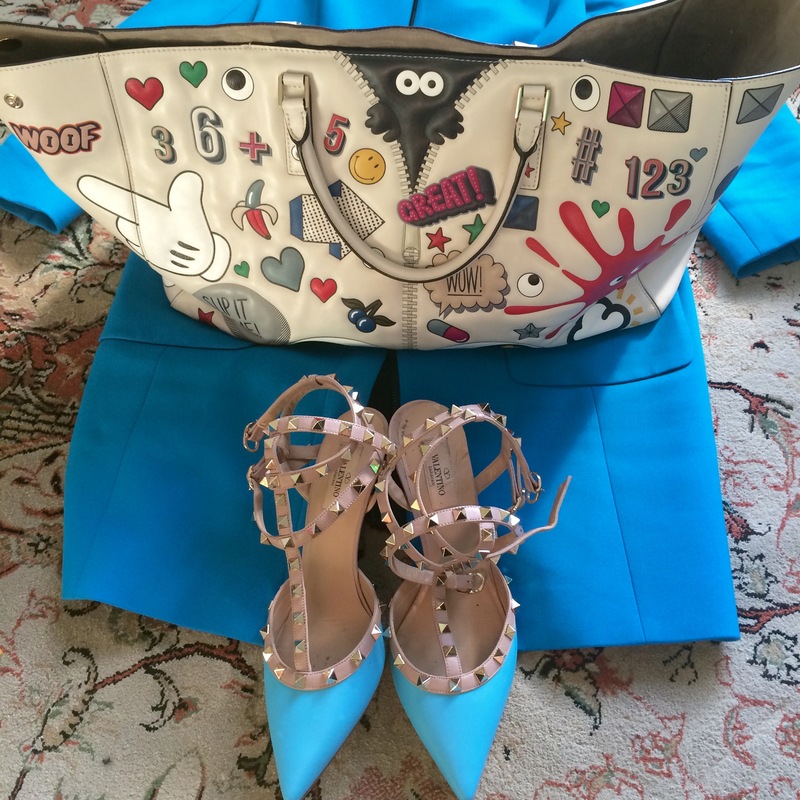 Such a cute pairing of the bag and the shoes! Thanks for always supporting my blog!